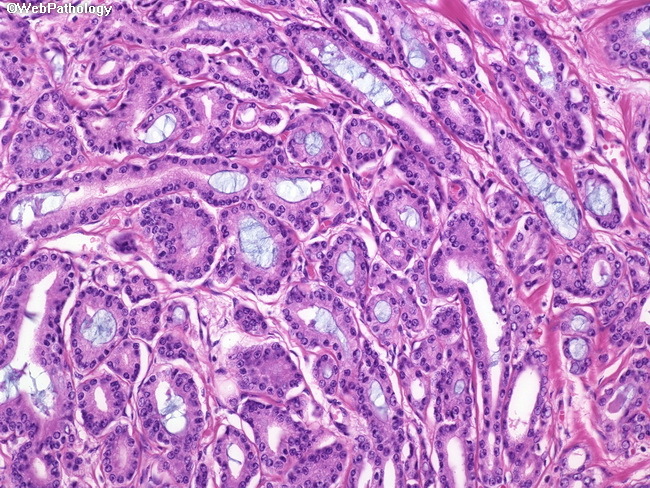 Intraluminal blue mucin is one of the minor diagnostic criteria of prostate cancer. The mucin is acidic and can be stained with Alcian Blue. The degree of prominence of mucin depends upon individual laboratories' H&E staining protocols. In our lab., it is uncommonly seen, whereas in the referral material from some other labs., it is readily apparent. Intraluminal mucin is not specific for prostate cancer and can be seen in many benign conditions.